After years of working in high tech, I became passionate about art. Currently I spend most of my time in the ceramics studio and enjoy working with clay. My inspiration comes from surrounding objects, jewelry, my garden, and my travels. In my work, I combine geometrical shapes with organic ones, with an emphasis on round objects, which I am especially drawn to. I like to explore the negative spaces in my functional pieces and my garden sculptures. 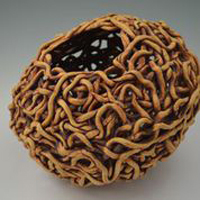 I also like working with coils, connecting them into fragile shapes while exploring the strength of the clay. I work in both stoneware and porcelain, throwing on a kick-wheel and now firing in an electric kiln, having joined the ranks of the energy conscious. The teapot has long been a favorite shape of mine. I take particular pleasure in the traditional round shape with its evocative association of family gatherings. 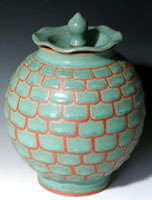 But I have also experimented with a more distinctive, stylized flat pot. I discovered clay and its creative possibilities over 15 years ago and have been hooked ever since. 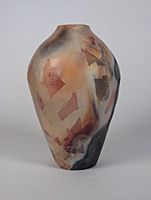 My ceramic designs are influenced by my prior interest in fiber and textile arts. Like fabric, I can print on clay and embellish it in multiple ways. 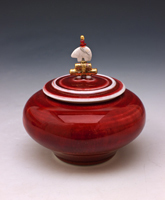 High fire porcelain is my clay of choice because it can be translucent and delicate yet at the same time very strong. I love to stitch clay pieces together to emphasize an object’s structure and give it a one of a kind look. 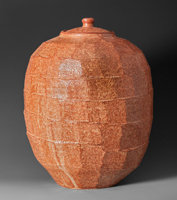 I like to think that my ceramic work reflects my interest in the simplicity and refinement of Japanese design while incorporating an earthy, hand-built appeal. 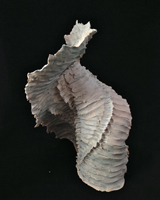 Geraldine’s ceramic art is influenced by her innate love of all flora and fauna. A native of New York City, the close proximity to many wonderful museums and parks nourished her love of art at an early age. 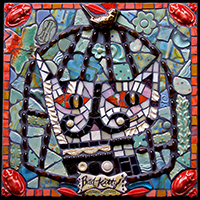 Birdwatching, a favorite past time, is reflected in many of her ceramic pieces. 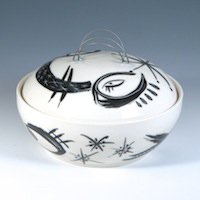 Imagery on clay has been an exciting addition to her current work which combines many techniques including screen printing, hand painted underglaze images and china paint decals. Landscapes and nature have always been a powerful presence in my life. My garden planters, birdbaths, and shrines combine a love of this region and an interest in some of its earlier history. 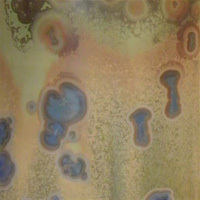 My glaze colors inspired by the nature of the Bay Area, are reminiscent of the Arts and Crafts movement of the early 20th century. The Victorian embellishments gleaned from antique stores and junk yards also evoke an earlier era of California culture. Dania Lukey is a full time studio potter in the Sacramento area. After receiving her architecture degree from Cal Poly at San Luis Obispo and studying in Italy, Dania discovered her love for clay while pursuing her Masters in Education at Sacramento State University. There her interests in architecture, Japanese poetry, contemporary art, and ancient textiles found a natural expression in form and function. She currently works from her home studio in Carmichael where she lives with her husband, dog Lucy, and their three chickens. The solitary process of working with clay has rewarded me with an experience of peace and centering. Dealing with the unpredictability of clay and fire has developed a patience and quiet strength that is evident in my compelling colors and elegant forms. I strive to impart these qualities and the joy of using a piece of art into the lives of those who use my vessels everyday. My hope is that the final piece stands as an exquisite witness to a moment when clay, glaze fire and potter were one. There is something mystical about a box. It is a special place where you can escape, your own small little world. It is where your treasures, your secrets are put on hold until the next visit. It is your private place, for you to share, if you wish. A box arouses your curiosity. The Mystery is unveiled when you lift the lid, the story is told. I like to make my boxes interesting with different textures, handles and glaze designs; I use the "Raku" firing technique, which gives my pieces an earthy and rustic look. They are each one of a kind. I was born in Minneapolis, Minnesota and raised in North Dakota. As a boy in the mid-west during the 1970’s, I had limited exposure to the arts. Sitting down at the potter’s wheel for the first time in a high school ceramics class, I immediately felt comfortable and know I was meant to throw clay. I’ve been doing just that since moving to California about thirty years ago. I was merrily pursuing a career in research when I took a casual course in pottery (1979). I immediately fell in love with clay and the transformation of amorphous blobs of mud into beautiful forms. I felt as though a hidden part of me had been revealed and it demanded expression. Soon I found that I wanted to devote all of my energy to making pots. I gave up my life in science for that of a studio potter (1982). ​I am basically self-taught in the craft.